The contractor, whom I've since hired as my cook, cleaner, and factotum, showed me a design called The Ultimate Iguana Habitat in a Better Homes & Lizards issue. Since I am the ultimate Iguana it seemed to be destined that I should have the ultimate pad. Yeah Baby! Some significant details had to be worked out of course since the article touting the habitat wasn't real long on details in certain areas of the construction. 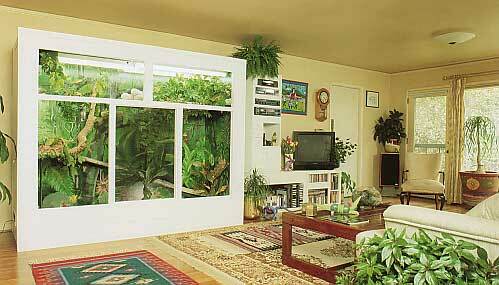 Here's a picture from Better Homes & Lizards showing what we were trying to build complete with fancy interior plant mural and decorations. It is 8' long, 6' 7" tall, and about 34" deep. I had a few basic needs which my new pad needed to satisfy. First it had to be warm, and not too expensive to heat. Second it had to be easy to keep clean (I don't want my maid service to have to work TOO hard afterall). Third it needed to look nice and be safe and comfortable to live in. Finally it had to be portable, since I don't plan on living in this apartment forever. The design is warm. The walls, floor, and ceiling are all 2 1/2" thick, and consist of foam insulation sandwiched between 1/8" plywood. 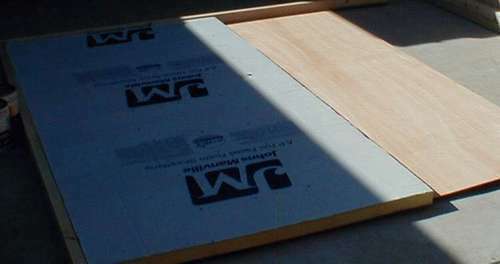 The edges of the "sandwich" are made of pine "2 x 4's" which are actually 1 1/2" x 2 1/4", and they give each wall section some weight and rigidity.When the plywood skins are nailed on the overall thickness of each wall section becomes 2 1/2". Here's the basic components laid out showing how they form the sandwich. Note that the foam panels I used are 4' x 8' and one side has a reflective finish. This shiny side, even though inside the sandwich, helps to keep heat reflected back into the enclosure. This picture shows the "back" of a wall section since the reflective side of the foam is face down. The design is also easy to clean. The assembled wall sections were painted with one coat of a good grade of primer (white) which seals the wood and makes it ready for the two final coats of water based paint (also white). White surfaces have almost as much reflective ability as a mirror so I was sure my pad would be bright and cheerful. The paint was from Sherwin-Williams and was chosen to be the most moisture resistant, mildew-resistant, and stain resistant paint they had. Both it and the primer went on VERY thick due to some material in the paint. This stuff has some nasty warnings on the can about how dangerous it can be (if inhaled. Probably due to Californias idiotic Proposition 65 law), but after it dried there is no detectable odor or taste from it. Cleaning the interior is easy because I lined the floor and my upper shelf with vinyl flooring. Sometimes mistakenly called "linoleum", the stuff you really want to use is vinyl flooring. Linoleum is made from linseed oil, and is more easily affected by cleaning chemicals, so vinyl is the better choice. It wasn't cheap, but nothing is too good for my pad. All edges/corners/joints inside the pad are sealed with a good grade of caulking to make the pad truly waterproof and well sealed. The design is portable. The pad is assembled of 4 wall sections, a roof, and a floor. They assemble using 4" long lag bolts (hex headed wood screws basically) which go through the pine boards in the edges of each wall. When it comes time to move these will be removed with a power screwdriver w/ socket attachment, the walls seperated, and moved to whwere ever. The top, bottom front and back are the heaviest, since they are either the larges or have glass or heavy plywood in their construction, but they can still, barely, be moved by one muscular contractor or hired hand. Two people can easily move each section. When assembled the unit is heavy and very rigid. However it can still be moved around my apartment (whch has a linoleum tile floor) because of the teflon slider-pucks screwed to the bottom of the pad. See How My Pad Was Built! All information on this site is © Robert Allen, All Rights Reserved, unless otherwise noted. 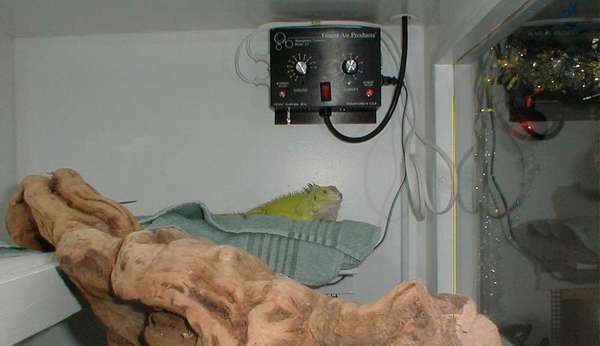 Information here may be used freely as long as it materially benefits Iguanas and credit is given to this site and to the habitat design work of James W. Hatfield III, author of "Green Iguana, The Ultimate Owners Manual"..